A blog about fitness and health in this crazy world. The last guy I dated never understood that running wasn’t something I did, but rather who I was. Running is what defined me in a way so absolute and so pure that no other thing on Earth came close to it. When I run I am the best version of myself. I am light, and free, and happy, and when I run there is part of myself that gets to just be and that is a wonderful thing. He never understood that I needed to go for a run. Not because I wanted to or because I felt fat, but because that’s when I got to be me, and I needed that. Him and I didn’t work out because he never understood that part of me. 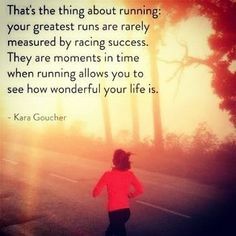 He never understood that running completed my life and myself. He never got that, and I had no way of impressing that upon him and so we didn’t belong together. If you cannot look into my eyes and see that running is part of my soul then we do not belong together. Happiness for me is running and I smile when I run and I laugh and I cry and it is everything. I never get to fully be Wendy except for when I am out there running, and some people don’t get that. It’s okay, they can’t all be runners. But I am. Running is what defines me and it is what will for the rest of my life. If you can’t see me in that context then you are not meant to be a fixture in my life, but rather a passing thought. Someday I will find the man who sees that in me, and then I will get to be Wendy all the time, not just when I run. Awesome post, running and gym are a part of who my wife and I are, so I totally understand. It is for sure a part of you.